Public charter school advocates from all across Texas convened on the south steps of the Capitol in Austin for a lunchtime rally on April 29. The event was headlined by Governor Greg Abbott, with a surprise visit from Lt. Governor Dan Patrick. Both had a message: create more charter schools in Texas. Over 1,000 pupils, parents, teachers and others came to hear that message, rallying on behalf of the nearly 203,000 Texas public charter school students and 105,000 students waiting for a seat at a public charter school. They also were there to support a handful of bills currently in the in the state legislature that would provide additional funding for charter schools. In December, the Texas Education Agency released its annual Public Education Grant list, revealing that 1,199 public school campuses across the state were identified as low performing. That means more than 736,000 students attend failing public schools. Charter schools have become a popular alternative to the traditional public school model, for parents who want more than the “one size fits all” classroom, or seek a more focused education for their children. Additionally, charter schools have offered educational lifelines to low income, Hispanic, and African American students – the demographics most likely to be trapped in failing schools. Abbott shared a success story in the Rio Grande Valley — a charter school in Weslaco. In his remarks, the Governor pointed out that school choice was not Republican or Democrat. “Texas must live up to its promise to deliver the best education for our children. To do that we will work on more funding and the expansion of charter schools in the State of Texas,” he said. Right now, more than 100,000 students are on waiting lists for admission to free public charter schools. They are part of the public school system, and must meet the state’s academic standards, but they are not given facility funding. There are two bills, one in each chamber of the Texas Legislature, that address this funding issue. 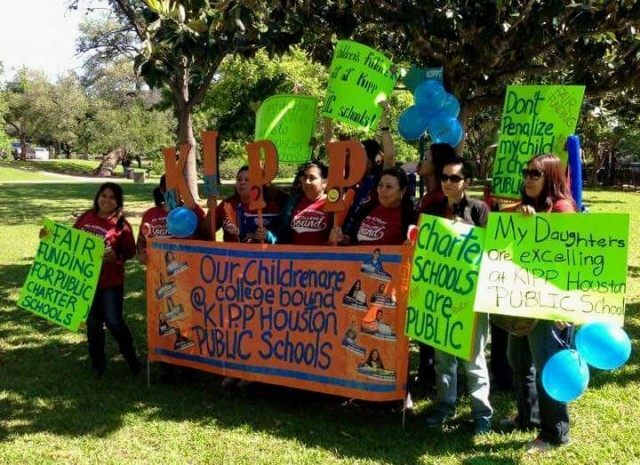 “Charter school students shouldn’t be treated like second-class citizens,” Matt Prewett of the Texas Parents Union, an attendee at the rally, told Breitbart Texas. Public charters schools were authorized by the Texas Legislature in 1995 to provide more choice and options in public education. Texas has a state cap of 215 open-enrollment charters, with multiple campuses per charter. Open enrollment charters serve approximately 154,000 students on approximately 460 campuses across the state. In Texas, charter schools operate under the Texas Education Agency, which issues academic accountability ratings for each school. Both charter and traditional public school students in Texas take the State of Texas Assessments of Academic Readiness (STAAR) tests. Public charter critics claim school choice will dismantle traditional public education by privatizing schooling, although traditional public schools also engage in similar public/private partnerships. Critics also fear tax dollars will be taken from traditional classrooms. Some dislike charters because they have appointed governance, while elected school board members belong to a lobbyist organization, the Texas Association of School Boards. In Texas, as across the nation, the most powerful opponents of charter schools are lobbyists and teachers’ unions. Charter school teachers are not unionized. Recently, the Parent Trigger Law, SB 14, sailed through the Texas Senate. Breitbart Texas reported that this bill would shorten the amount of time parents must wait to remove their children from failing schools, from five to three years. Other legislators who spoke at the rally included Sen. Larry Taylor, chair of the Senate Public Education Committee; Sen. Don Huffines; Rep. Harold Dutton; Rep. Jim Murphy; Rep. Rick Galindo; Rep. Dwayne Bohac; Rep. James Frank; and Land Commissioner George P. Bush, who delivered some of his remarks in Spanish. The crowd went wild. On January 30, another rally was held on the Capitol steps to promote a broad range of school-choice options, as Breitbart Texas reported.